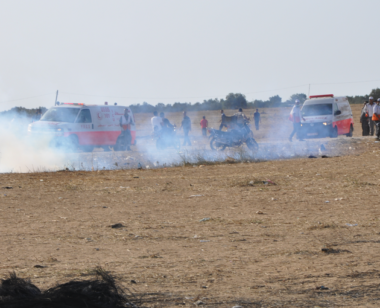 Israeli soldiers shot, on Wednesday evening, a young Palestinian man with a live round, and caused many others to suffer the effects of teargas inhalation, in Jabalia, in the northern part of the Gaza Strip. The Palestinian Health Ministry in Gaza said the young man was shot with a live round and described his wounds as mild. It stated stated that the young man was moved to the Indonesian Hospital in nearby Beit Lahia, and added that dozens of Palestinians suffered the effects of teargas inhalation.